Bingo! To the ones who once dreamt of hovering in the limitless sky! 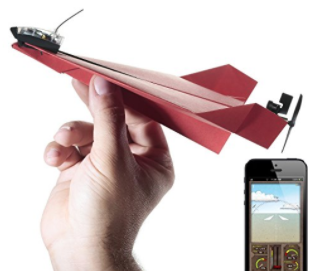 A 10-minute of ride in the sky, towards an unknown destination has been made easy with this Smartphone controlled paper airplane. This airplane is the first of its kind and has the capability to wrap a distance of 55 metres after it has been fully charged. Moreover, guess what, to add a cherry on the top of the cake is its ergonomic design! The plane has a crash resistant design that labels its meticulousness in turning with responsive motion. Then why worry, when you can get that airplane to fly by just tilting your Bluetooth enabled Smartphone (iOS and Android)? This portable airplane has come as a great efficacy to the students belonging to Science and Technology. The design has helped the airplane to be the best way to educate the students on the basics of the lift and aerodynamics. The preeminent thing about the airplane is its easy handling. The entire control is completely like a simulation process giving the real feeling of the view through the cockpit windscreen. Undoubtedly, this paper airplane is the best invention to be used both as recreation as well as education purpose. Bang on guys, this product must be in your “never to be missed products’ list”.